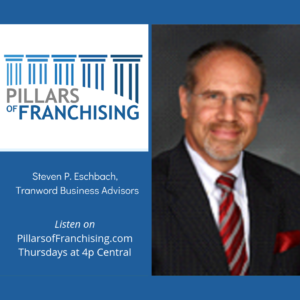 Steven P Eschbach, CFA, is the President and Owner of Transworld Business Advisors of Naperville where he assists business owners with the confidential sale of their businesses and/or expansion through franchising. Through the process, he assists entrepreneurs with great opportunities to buy existing businesses or franchises. In addition, Steve is the Principal and Founding Member of Eschbach & Associates, LLC, a financial communications and investor relations consulting firm that assists its clients achieve its strategic goals and objectives in its communications efforts with the investment community. Prior to establishing these Illinois-based companies, Steve was the Vice President – Investor Relations for Integrys Energy Group, Inc. (NYSE:TEG), a $5.5 billion market cap holding company of five Midwestern utilities in Wisconsin, Illinois, Michigan and Minnesota, from 2007 to 2015. Integrys was acquired by Wisconsin Energy Corporation, and he departed the company upon the close of the merger transaction in June 2015. Steve has held the lead investor relations role for several technology and energy companies such as FuelCell Energy, Inc., RMI.NET, Inc.; Kinder Morgan, Inc.; and Yankee Energy System, Inc. Prior to his investor relations roles at these companies, he was an expert financial witness in public utility rate cases for the State of Connecticut where he prepared and defended testimony in over a dozen proceedings on financial issues such as rate of return on rate base, return on equity, capital structure and other accounting topics. Steve has a Bachelor of Science degree in accounting from the University of Connecticut (1980), and holds a Masters Degree in Business Administration from the University of Hartford (1985). He attained his CFA Charter designation in 1989 and is former member of a number of advisory committees of the CFA Chicago Society. Steve serves/has served leadership roles in several voluntary and professional organizations. ⦁ President, St. Charles (IL) Business Lounge, a local business development networking group and shared office space (2018-present). ⦁ Full Board Member/Marketing Committee Member for the Naperville Business Lounge, a local business development networking group and shared office space (2017-present). ⦁ Co-Chair of The Financial Executives Networking Group’s Chicago (Downtown) Chapter, a forum where senior financial executives share job opportunities and career development experiences (2016-present). ⦁ Executive Board Member (Secretary) of the Community Career Center of Naperville, a locally-supported non-profit organization that provides diverse resources to empower job seekers to achieve sustainable employment (2016-present). ⦁ Former member of the National Investor Relations Institute (NIRI), a professional association of corporate officers and investor relations consultants responsible for communication among corporate management, shareholders, securities analysts and other financial community constituents, from 1997 through 2016 and is a past President of its Rocky Mountain (2001) and Connecticut/Westchester (2005-2007) chapters, and a former board member of the NIRI-Chicago chapter (2008-2013). ⦁ Co-leader of the Career Transition Ministry of St. Raphael’s Parish in Naperville, IL, a church-supported networking group to assist job seekers (2009-present). ⦁ Past Board Member of the Knoch Knoll Homeowners Association (over 400 homeowners) in Naperville (2015-2017).